Sorry to hear that you are having issues. We do not stock the cleaning cartridge for this printer. Please find the link below which gives instructions on how to perform a print head clean on your printer. Hi, I have a HP 5510 Photosmart printer, which I use at at home for odd bits here and there and will be using for my college course. I've been told to only use original HP cartridges but now, seeing the price difference, I'm tempted to go for the cheaper ones you sell. What would you recommend? Thanks, Laila. We recommend the premium brand compatible HP Photosmart 5510 ink cartridges for users on a tight budget. Our compatible HP Photosmart 5510 ink cartridges work in exactly the same way as original HP cartridges so you shouldn't notice any dip in performance or reliability when using them. They also produce the same amount of pages as the genuine HP Photosmart 5510 printer inks. We offer a 30 day money back guarantee on our compatible HP Photosmart 5510 ink cartridges so unless you're fully satisfied by the quality of them you can send them back to us for a refund or replacement. I don't understand illustration three of how to fit the cartridges, inside the top of my HP Photosmart 5510 printer? I've seen 364X or 364XL I think. Are these okay for use in my Photosmart 5510 printer? Will they fit? Thank you, Tracy. Yes, the 364XL cartridges will work in your Photosmart 5510 printer. The only difference between the HP 364 cartridges and 364XL cartridges is that the XL versions have a higher capacity of ink. The website says "guaranteed to work with my printer" which leads me to ask if they're actually genuine HP cartridges for my Photosmart 5510 printer, manufactured by HP and not by anyone else? Any cartridge described as "Genuine HP" with the HP logo beside the product image is a brand new and original Hewlett Packard cartridge that comes in sealed packing and has been manufactured by HP. We also supply compatible HP Photosmart 5510 ink cartridges which are described on our website as "Premium brand recycled ink cartridges". These are non-HP cartridges which are manufactured by a third-party and are clearly branded as such. All the cartridges we list under your HP Photosmart 5510 printer are guaranteed to work in the printer regardless of whether they are genuine or compatible branded supplies. How do I know when to replace the HP Photosmart 5510 coloured ink cartridges? I checked levels and the coloured are all about the same level and the black is almost full. I get a message that says, "Do not change printer cartridge unless it is empty" but how do I know that. I'm printing and everything is coming out red instead of black. Should I change all three coloured cartridges; or how do I know which one is empty? Your Photosmart 5510 printer should tell you which cartridge is running low and you should get an alert when you need time to change them. Please refer to your manual to see how to check ink levels on your HP Photosmart 5510 ink cartridges. You can also try to run a cleaning cycle if the prints are comnig out red but the black cartridge is full. If you need any further assistance please contact HP for technical support. I want to cancel a printing request - some days ago I stopped my Photosmart 5510 printer wading through 27 pages of insurance policy. It will not "forget" the request even if switched off and then on again days later? Thank you. Can I buy only a black cartridge for the HP 5510 Photosmart? I need the largest capacity HP Photosmart 5510 cartridges in all colours. What is available for me to buy? Can you buy separate black ink for the HP Photosmart 5510 printer? I think it uses 364 No. ink or do you have to buy all the inks and replace them in one go? It's just the black ink that has run out at the moment. Thanks. Hi, I'm interested in your premium brand HP Photosmart 5510 inks. Can you confirm these compatible inks are long-lasting and provide photo quality output? Our premium brand compatible HP Photosmart 5510 ink cartridges have been strictly checked and tested to ensure that they provide a very similar level of print quality and performance to the genuine HP versions. You should see little or no difference in the quality of photo prints when using these cartridges as opposed to HP originals. Nevertheless, we still offer you a full, 30 day money back guarantee on our premium brand compatible HP 5510 ink cartridges so you can try them risk free. Can you order just the black XL cartridge for the HP Photosmart 5510 or can the cartridges be refilled? We seem to go through cartridges very quickly not getting the amount of pages advertised? The page yields stated on the website are based on 5% coverage of an A4 page so realistically, you won't print the quoted number of pages if you're printing full pages of text or images that use up a lot of ink. 5% coverage usually equates to a paragraph of text so you should try and estimate the life of the cartridge based on the nature of your printing. Do I need to order a different type of ink for photos than normal prints ? I printed out a photo but it was blurry? No, the HP Photosmart 5510 printer doesn't accept specially derived inks for photo printing. The HP 364 ink cartridges are designed to be able to print high quality photos. Please adjust the settings on your printer to ensure that you get the best results for photo prints. Your printer manual should explain this is more detail. 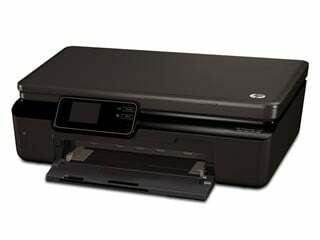 Can I use 364XL ink cartridges as well as 364 cartridges in my HP Photosmart 5510 all-in-one printer? Yes you can, these cartridges are different capacities. It's entirely up to you which cartridge you require. If you're a heavy user of ink then we would recommend the high capacity 364XL cartridges. If not, then the standard 364 cartridges might be better for you. If I buy a new HP Photosmart 5510 home printer, will it come with any print cartridges supplied? If so, will they be standard size or tiny sample 'starter' versions? Also, please send prices for each ink cartridge. Many thanks, Clive. We do not sell printers so could not guarantee this information. However, most new printers are supplied with 'starter' cartridges installed. You can view all of our current prices for HP Photosmart 5510 ink cartridges on our website. They're listed above. What is the maximum thickness of paper or card that the HP Photosmart 5510 printer will accept? Unfortunately, as we do not sell printers we're unable to provide this information. I recommend contacting HP directly as they will have this information. I've got a HP Photosmart 5510 and I'm going to let the school borrow it for Santa's Grotto photos. Can you tell me how many photos they'll get from a cartridge? They need to work out what to charge and will need about 100 - 150 photos? Kind regards, Sarah. It's hard to calculate exactly how much each photo will cost due to the fact that HP Photosmart 5510 ink cartridge yields are based on 5 % coverage of an A4 page, not a full colour photo. We suggest that you purchase a 4 colour HP 364 or 364XL multipack to cover your printing needs although we're unable to give an accurate costing for the criteria you've specified. Built and designed for average household use, the Photosmart 5510 is a good buy for people looking for a basic printer, scanner, and copier for the home. The CQ176B, as this printer is also known as,features wireless capabilities and is equipped with HPs revolutionary ePrint system. The Photosmart 5510 is also compatible with Apples famous AirPrint, so its easier to print directly from Apple devices such as the iPod touch, the iPad, and the iPhone. This compact 5.7 x 17.2 x 12.8 inch device weighs just a little over 11 pounds and features a low-capacity paper tray and a smart touch screen panel right above the paper slot. The Photosmart 5510 likewise has card slots for standard SD/Memory Stick Duo and MultiMedia Cards, along with a USB port for wired PC connection. The Photosmart 5510 takes an average of 1 minute and 2 seconds when printing out a 4x6 photo. The output quality is excellent, especially for less demanding prints (school work, general business documents, etc.) as well as for photos. The Photosmart 5510 allows easy printing and sharing, and has a maximum scan resolution of up to 1200 dpi. HPs Photosmart 5510 lacks some basic business functions, but thats typical of a small office machine designed primarily for home use. Running costs can be a little high at almost 15 cents for coloured pages, and over 4 cents for monochrome pages.